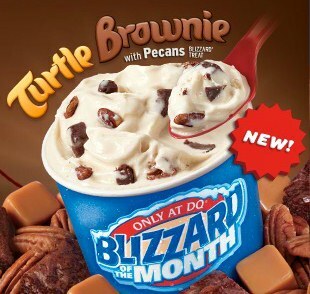 [New for 2012] That's right, June 2012 blizzard of the month is the brand new Turtle Brownie with Pecan blizzard. Some of you might be thinking "hey, that sounds oddly familiar?". Well, you are partially right. January 2010 gave us the Turtle Pecan blizzard which had the same base ingredients except now we've got brownies in the mix. So here is the official view. And here's my treat from Monday! I know the pictures never match up, but I think mine technically looks better. Notice theirs has just big chunks and an off-white base because of the caramel swirl. Yes it's tasty looking, but notice in mine how the brownie bits (and some pecan shell) have been blended into oblivion. That can be a bad thing, but here it's not. 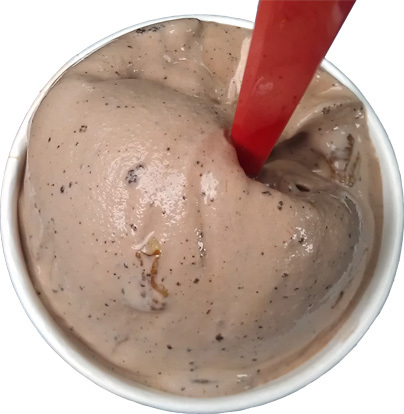 Just like the Reese's blizzard, this overblending helps spread the flavor and make ever bite enjoyable. They must blend up a bunch of the brownies first and then they throw in a small second group of them with a bunch of pecans for a mild blending so that they stay whole. Yes, that's right, the pecans stay whole and they add a wonderful soft crunch to every bite. I got at least one if not 2 or 3 in every scoopful. I always forget what a mild flavor pecans have, or how soft they are, but it totally works in softserve. The funny thing is that this should be the Pecan Brownie Blizzard with Turtles... no wait, that's not right. My point is the Pecans are numero uno here, they are backed up by an understated brownie flavor, and then there is a hint of sweet caramel to tie it all together. This tastes like a pecan brownie, and that's a good thing. I liked this blizzard, I really did. I saw some comments of people thinking it was tame or boring, but apparently they've never had nuts in their brownies. I'm 90% sure we use to have pecan brownies as kids and they were awesome. That cool combo is captured here and I enjoyed every scoop. It wasn't too sweet, too crunchy, too chewy, just a nice homage to a different kind of brownie. I liked this one so much, I went back on Tuesday to try it in chocolate. On Second Scoop: Behold a Chocolate Turtle Brownie with Pecan Blizzard Treat! Again we are greeted with whole pecans and brownie bits everywhere. 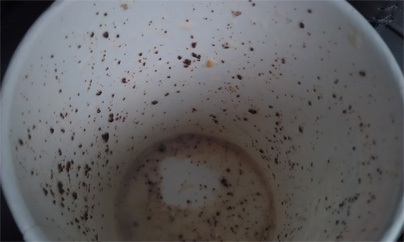 Just like pretty much every other blizzard I've tried with chocolate softserve, everything gets drowned out by the chocolate. Sure, it's still fairly tasty, and I still enjoyed it, but the caramel flavor is obliterated, the brownie vibe is buried, and the delicate pecans are crunchy but mostly unflavored. 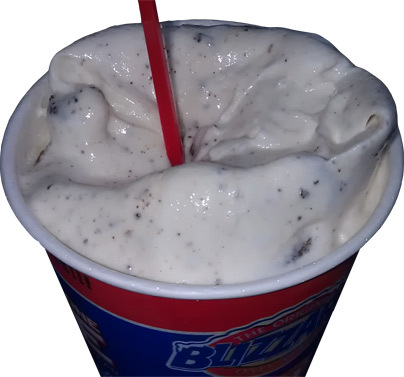 Maybe with a twist (half vanilla/half chocolate) we could strike a balance, but I don't think I should be hitting DQ for a third day in a row to try out my theory. You are welcome to try this blizzard either way, but I would go vanilla. Don't miss this one. I FINALLY made it to DQ just in time for this treat and wow were you right! I too got a mix of blended pecans and brownies and then large chunks of each in my blizzard. It was all about the mixins with a side note of caramel which is the way it should be. Tasted just like a delicious nutty brownie!! Just came across your blog and have enjoyed reading the reviews! I tried this month's Choc Turtle Brownie w/Pecan Blizzard @ DQ ,and while it was good, I think I still prefer the Georgia Mud Fudge, which is similar except that it does not contain caramel. I usually ask for choc ice cream when ordering choc-based blizzards, but the addition of fudge in the GMF means it is chocolatey enough, even when ordering vanilla ice cream!